Before my visit to Cambridge, England, punting meant kicking the ball to the other team in American football. Well, here there is a totally different type of punting. It involves a canoe-like boat that you maneuver around using a long pole. How hard can punting be? The boat looks sturdy and the Cam river looks calm. Would it be better to take a tour or give it a go on our own? 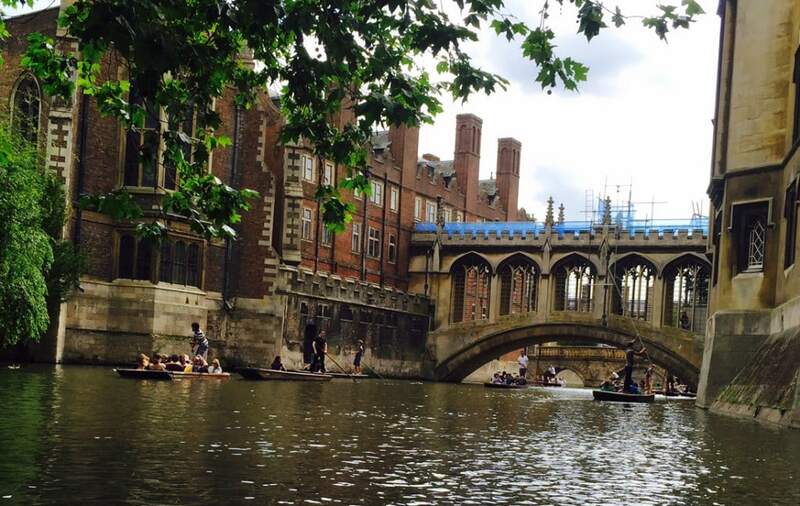 We decided to give punting in Cambridge a go, and it turned out to be an adventure. Let me tell you more about it so you can learn from our experience punting on the Cam. Cambridge is about an hour away from London Liverpool Station by train, which is probably the best way to get there as parking can be an issue on a busy day. We drove and found parking at the Grafton Center, which is a nice mall that also has a movie theater. We walked through the mall and found our way to the Cam, the river in Cambridge. 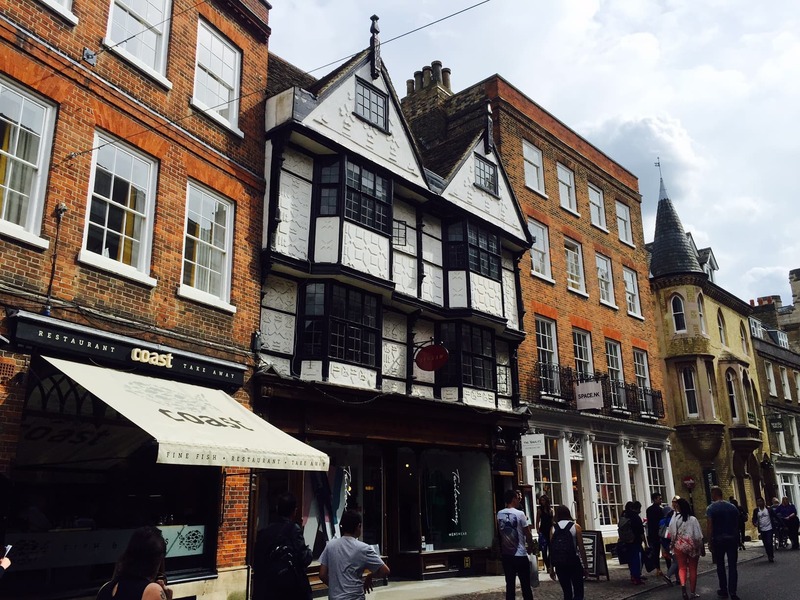 The town has so much charm, I enjoyed seeing all the traditional English homes and buildings. We walked along the Cam river towards the section where they allow punting. We saw some traditional canal boats and there were also many nice restaurants right on the river. An eager salesman from a Cambridge Punting company approached us and asked if we were interested in punting on the Cam. There are two options – you can do the punting yourself or you can join a group tour with an experienced punter who will also teach you more about Cambridge. The salesman warned us that because it was a “bank holiday weekend” (long weekend in American English), the river was very crowded and he had already seen several people fall into the water. I panicked a bit – I didn’t want to fall in the water. Luckily, Russell, my boyfriend, is braver than I am and he insisted we do it ourselves. He agreed he would do the punting, although he told me I should try it at some point. 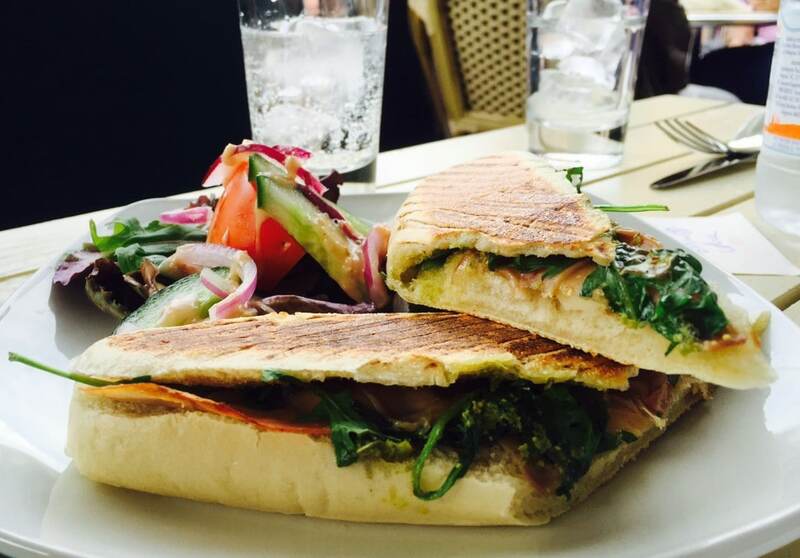 We decided to grab some paninis at a small shop and enjoy it outside by the river. Then we were ready to try punting in Cambridge. We settled into our Cambridge punting boat. I decided to face backwards so it would be easier to talk. Looking back on things, it might have been better for me to face forward so I would be more aware of the boats ahead of us. As Russell was figuring out how to punt, the boat was drifting to the side. Before I knew it, another boat trapped us against the side. I had to push their boat away so that we would have some room to head down the river. Russell ducking as we passed under the bridge. I enjoyed being on the water and the beautiful scenery. Along the river, there were beautiful green areas and gorgeous old buildings. If I would have had more time, a picnic in Cambridge would have been nice as well. We passed under two bridges (where the punter needs to duck to avoid hitting his/her head). One of the bridges is known as the Bridge of Sighs. One story I heard to explain the name was that Queen Victoria had said it looked like the one in Italy. There is a very faint resemblance, but ok. I preferred the second explanation that the bridge got its name because students would let out a big sigh on the bridge after finishing their finals. While I was enjoying myself and the beautiful scenery, Russell was working hard. Punting is not easy, especially when the river is crowded. The correct way to punt is to stand on top of the boat, so I can see how people might fall (although we never saw anyone fall). Russell decided to play it safe and stood in an area where you would normally sit so that the edge would maybe prevent him from falling. I can’t count how many times other boats hit us while we were punting on the Cam River. I expected that the tour guides/punters were experienced so they would easily be able to navigate along the river without crashing into you. Well, that assumption turned out to be off. We were bumped by the tour boats as well as other tourists. There was one tour guide that actually yelled at us when we crashed. He wanted to make sure our pole didn’t hit anyone on his boat, but he could have been more reasonable about it. We didn’t go all the way to the end, but we figured it was time to turn around. This was not as easy as it sounds, especially with the amount of traffic on the Cam river. So we struggled for a bit, trying to wait for an opening. Then a nice tour guide came by and coached Russell. As we got close to the dock, we tried to get the attention of the attendant to help us park the boat. We didn’t even realize how quickly we were approaching the dock, then bang! This was our hardest crash of the day, but luckily we were still able to stay dry. All in all punting in Cambridge made for a memorable and fun afternoon. Even if you are only doing a Cambridge day trip, it is worth either trying punting on your own or doing a punting tour. There is so much to do in Cambridge (such as the Cambridge American Cemetery and the Fitzwilliam Museum), I suggest you make a weekend out of it. If you can stay longer, then it gives you time to do some day trips from Cambridge as well. If you stay at Citystay, like we did, you can go punting for free! Citystay are managed apartments, so in addition to saving money on punting, you also get significantly more space than a typical hotel room, a well-stocked kitchen, a gym, and an indoor swimming pool. The apartment had plenty of high tech features like mood lighting and curtains on timers. We had a wrap around balcony too. Additionally, the apartment was so impeccably clean that we felt like we were the first people to stay in it. I felt so at home, I didn’t want to leave! A panoramic of the living room and kitchen at our CityStay apartment. 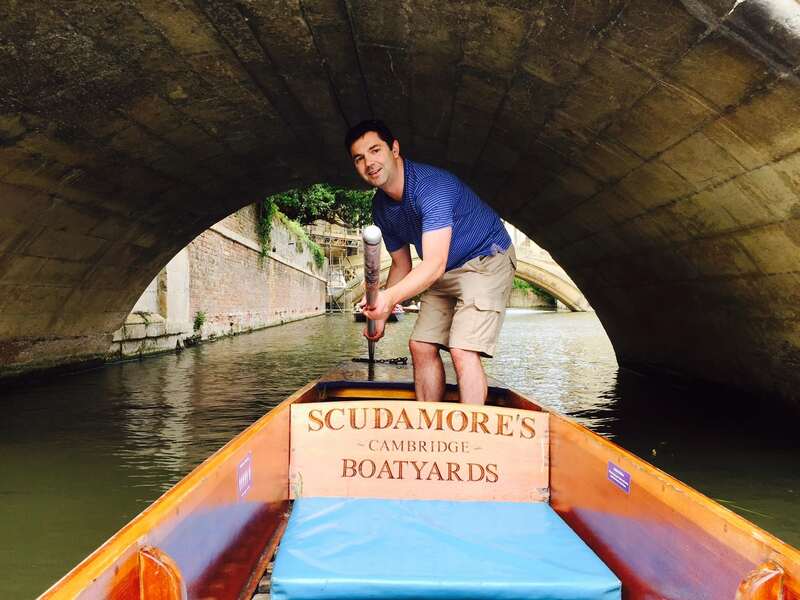 If you want to book punting in Cambridge on your own, there are several punting companies (we used Scudamore Punting Cambridge). I think all the companies are all pretty much the same. Punting in Cambridge prices when you hire your own punt are around £30 per hour, 1-hour minimum. The charges get prorated after one hour. You leave your credit card as a deposit and then pay when you finish punting. If you plan on punting for 90 minutes, you can get a discount by booking online in advance. 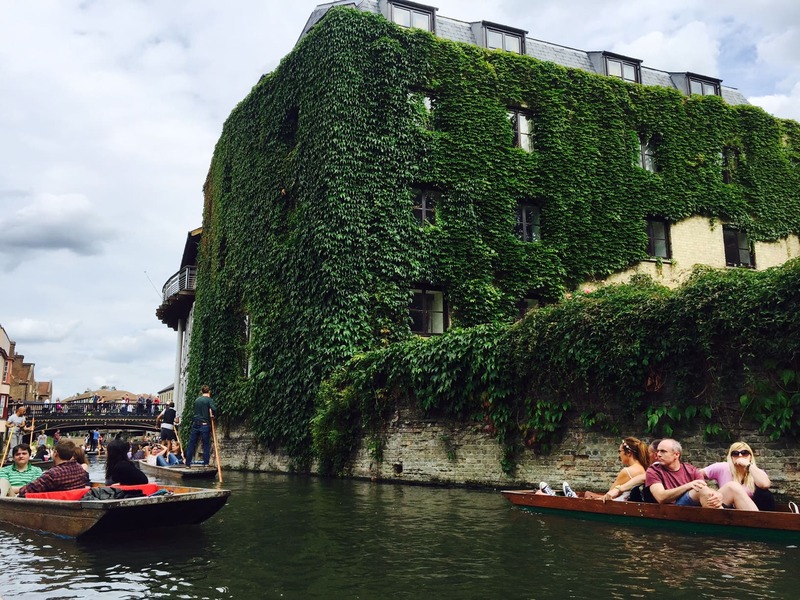 I definitely want to come back and try punting in Cambridge myself – maybe! Have you tried it? I would love to hear about your experience with Cambridge Punting in the comments. Try to go punting when the river is not too crowded (weekday) if possible. 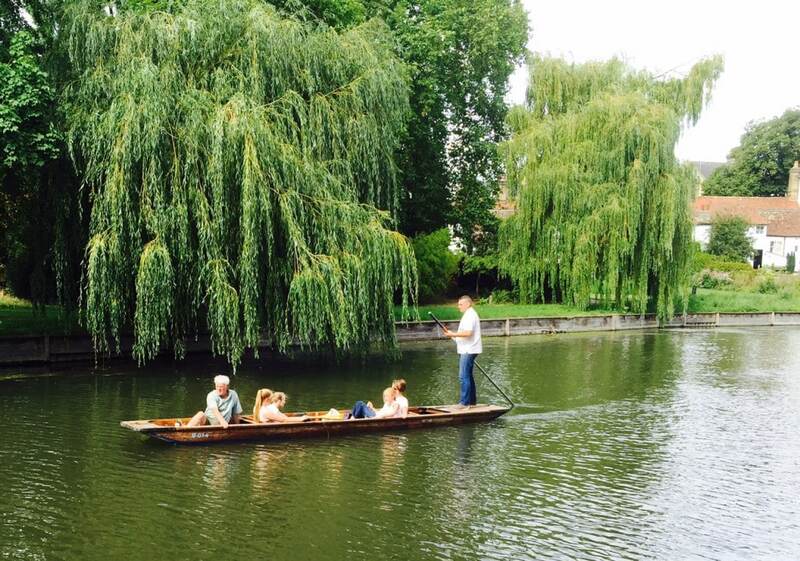 Stay at CityStay and get a great Cambridge punting deal – you can do it for free! Review these tips before you go punting in Cambridge. Disclosure: No financial compensation was received, but CityStay did provide a discount on our stay. As always, opinions expressed here are my own. Anyone would think you were in Venice! Yes, it is very similar to a gondola but you have the option to do it yourself! Yes, it looks much easier than it actually is! Yes and it is so beautiful there! This takes me back… Rich did his PhD in Cambridge. In fact you probably punted right past his college (Darwin). Even more significantly, he and Sue were married there! Glad you enjoyed it. I want to go back and explore the colleges more, they really are beautiful. And I can see how it would be a lovely place for a wedding!